The Samsung Galaxy Buds are decent, mixed usage, truly wireless headphones. They're comfortable and well-built, and their sound is decent and suitable for a wide variety of music genres. They are great for sports as well, thanks to their small, portable, and breathable design. They isolate a decent amount of ambient noise and they barely leak, making them suitable for the office and for commuting. However, their latency is very high and they don’t have internal storage like the Samsung Gear IconX. We also experienced some audio cuts and connection stability issues, which may be a deal breaker for some. On the upside, you can now charge the case wirelessly, which is a nice addition. Long single charge battery life for truly wireless headphones. The Samsung Galaxy Buds are very well-designed, truly wireless headphones. They are very lightweight, and you should barely feel them inside your ears. They are well-built and are stable enough for sports activities and running. Also, their touch-sensitive control is accurate and decently easy to use. They come with a great case that protects the headphones well, and you can charge it wirelessly. The Galaxy Buds are very small and don’t protrude much out of your ears. The bud design is sleek and feels high-end, and the back of the headphones are glossy and act as a touch-sensitive control scheme. They come in 3 monochromatic designs: black, white, and yellow. The Galaxy Buds are very comfortable in-ears. They don’t enter your ear canal too deeply and don’t put pressure on your inner ear. They are very lightweight and you barely feel them. 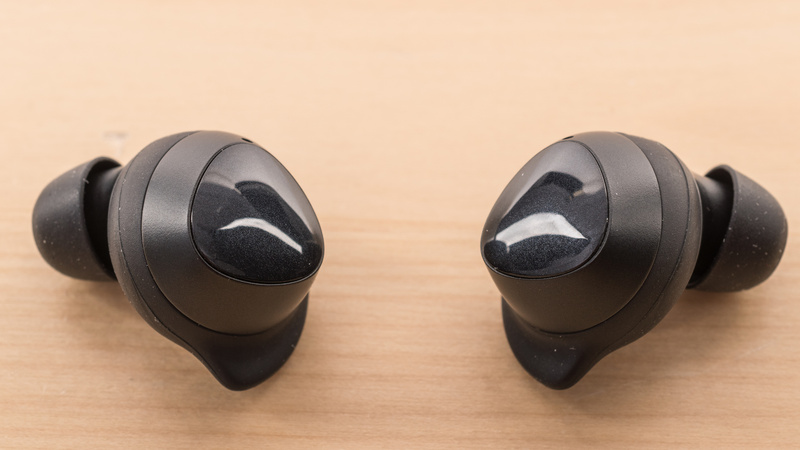 The stability sleeves help get a nice fit, but not everyone will find in-ears as comfortable and some might suffer from soreness after a while. On the upside, they come with 3 options for both tips and fin sleeves to help you find the best possible fit. These earbuds have a decently easy-to-use, touch-sensitive surface on the back of the earbuds. You get access to common functionalities such as call and music management and track skipping. You can also map the press and hold command inside the mobile app, which is not available on iOS. You can choose between volume control, voice-enabled controls or ambient noise mode. However, mapping the volume controls automatically sets the right earbud to volume up and the left one to volume down. On the upside, if you prefer to change your listening volume on your device, you can set the voice-enabled controls and the ambient noise mode on separate buds. However, without the app, the default setup is the device voice assistant. 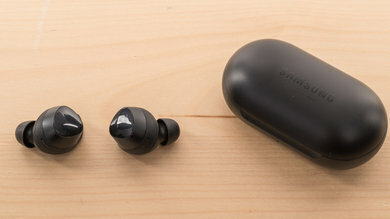 Like most in-ears, the Galaxy Buds are very small and don’t trap a lot of heat inside the ears, which makes them a good option for sports as you shouldn’t sweat more than usual when wearing them. The temperature difference is negligible, and most won’t notice it. 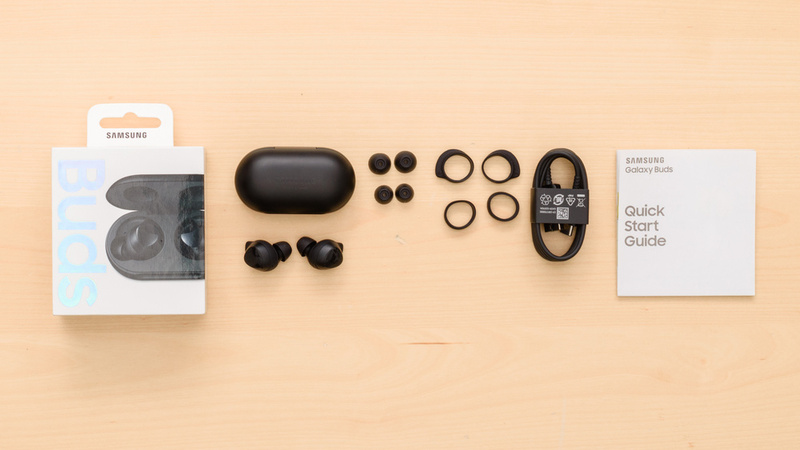 These truly wireless earbuds are very compact and can easily fit in pockets or a bag. They are easy to carry around, and their hard case also fits inside a pocket. The Galaxy Buds’ case is solid and compact enough to carry around on you at all times. It protects the headphones from physical damage from falls and scratches. However, since it’s a charging case, you shouldn’t expose it to water. Unfortunately, the case only holds about 1 additional charge, which is slightly disappointing when compared to other similar truly wireless earbuds. On the upside, the case supports wireless Qi charging. These earbuds are well-built and feel solid, but aren’t quite on par with the nice and dense build of the Sennheiser Momentum True Wireless or the unique design of the AirPods 2 2019. 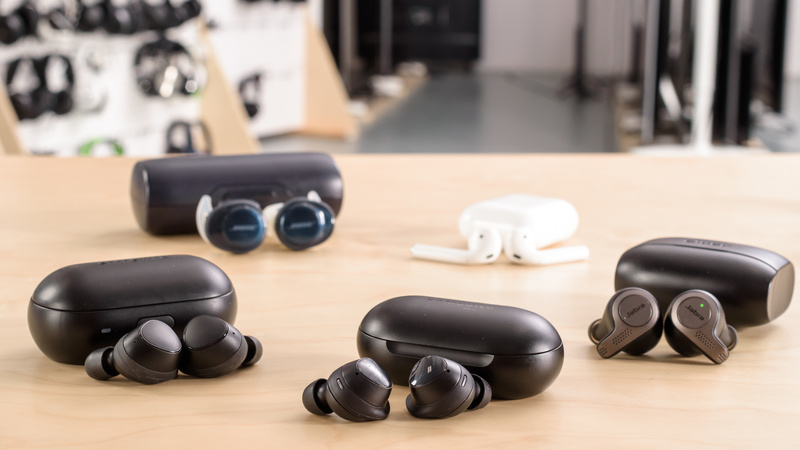 Nevertheless, the Galaxy Buds should survive a few accidental drops without too much damage, and their case protects them well. We will keep using the headphones and see if the Galaxy Buds have the same clogging problem as the similarly designed Samsung Gear IconX when working out with them, especially since they are also rated IPX2, which is slightly disappointing. The Galaxy Buds are stable headphones and you should be able to jog with these without them popping out. Their stability fins aren’t as big as the Gear IconX, but they feel as secure and you should still be able to be active with them. They stay in place during workout routines and their wireless design gets rid of a cable that could yank the headphones out of your ears. Also, they come with different tip and fin sizes, so you should be able to mix and match to find the most secure and comfortable fit for you. These truly wireless headphones don’t have any audio cable but come with a USB-C charging cable. The Samsung Galaxy Buds are decent sounding closed-back in-ears. They have a punchy and consistent bass, a well-balanced mid-range, and a great and flat treble. However, their bass is on the light side, and the mid-range is a bit overemphasized, meaning vocals and leads will sound slightly thick and cluttered. Their treble is also slightly sibilant and might be sharp for some. Nevertheless, these headphones are very versatile for a wide variety of music genres but might not be ideal for music with lots of sub-bass like EDM and dubstep. On the upside, you do have EQ presets that help you slightly customize their sound profile. The Samsung Galaxy Buds have a very good bass. LFE (low-frequency extension) is at 27Hz, which is good, but combined with low-bass of -3dB, indicates that the earbuds are a bit light on sub-bass. Mid-bass, where the body of bass guitars and the punch of kick drums sit, is quite well-balanced but underemphasized by 2.5dB. 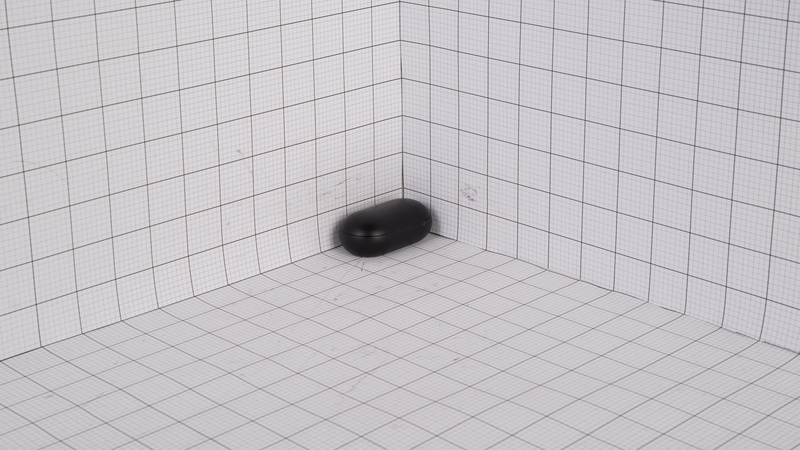 High-bass, however, is flat but there is a slight bump before 250Hz, which adds a bit of boominess to the sound. The mid-range performance of the Galaxy Buds is flat and even, but it is slightly overemphasized. Vocals and lead instruments will be accurately reproduced, but they might sound a bit forward in the mix, with high projection and intensity. The 2dB bump in low-mid might also make vocals and leads a bit thick and cluttered. The treble of the Galaxy Buds is great. The response throughout the range is very well-balanced, but slightly over our target curve. This results in sibilants (S and T sounds) to feel overly bright and piercing, especially around 10KHz. However, not everyone will hear them as sibilant. They have an excellent frequency response consistency. If the user is able to achieve a proper fit and an air-tight seal using the assortment of tips that come with the headphones, then they should get consistent bass and treble delivery every time they use the headphones. The imaging is excellent. Their weighted group delay is 0.13, which is very low. The GD graph also shows that the entire group delay response is below the audibility threshold, suggesting a tight bass and a transparent treble reproduction. 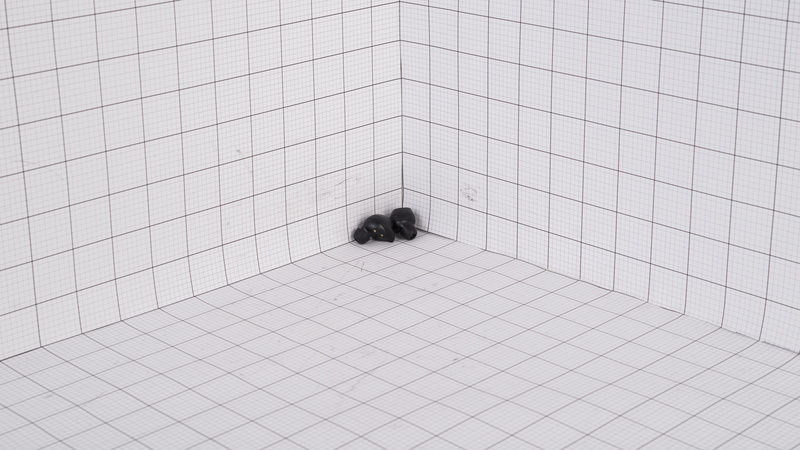 Additionally, the L/R drivers of our test unit were exceptionally matched, which is important for the accurate placement and localization of objects and instruments (like voices and footsteps) in the stereo image. However, these results are only valid for our unit and yours may perform differently. Like most other in-ears, the soundstage of the Samsung Galaxy Buds is poor. This is because in-ears bypass the pinna (outer ear), and don't interact with it. 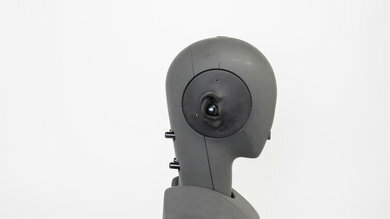 Activating the resonances of the pinna is one of the key factors in creating a speaker-like and out-of-head soundstage. Also, because of their closed-back design, their soundstage tends to be less open than that of open-back headphones. The THD performance of these headphones is okay. The distortion in the bass range is within good limits, but it is elevated in the mid and treble range. There are also lots of spikes in THD graph, meaning that these frequencies may sound harsh and impure. On the upside, there is no big jump in THD under heavier loads, which is good. The Samsung Galaxy Buds block more noise with their passive in-ear fit than some active noise cancelling headphones. If you can get a good seal with the provided tips, they will prevent a decent level of ambient noise from seeping into your audio. This makes them a good option for commuting or to block the office chatter of a lively work environment. They may struggle a bit with more low-frequency noise, like the rumbling sounds of an engine, but since they barely leak, you can mask some of the noise by listening to your music at higher volumes without distracting people around you. The Samsung Galaxy Buds have an okay isolation performance. In the bass range, occupied by the rumble of airplane and bus engines, they reduce the noise by about 4dB, which won't be as good as noise cancelling headphones. 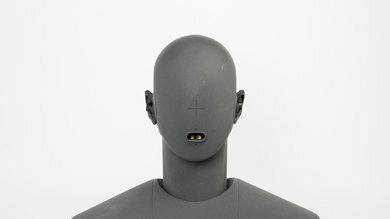 In the mid-range, important for blocking speech, they get 21dB of isolation, which is very good. In the treble range, occupied by sharp S and T sounds and A/C system noise, they achieved more than 44dB of isolation, which is excellent. The leakage performance is excellent. 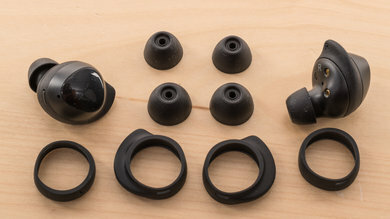 These in-ears do not leak in the bass and mid ranges, and the entire leakage is concentrated in a narrow band in the treble range meaning it will consist of sharp sounds like S and Ts. The overall level of the leakage is not very loud, either. 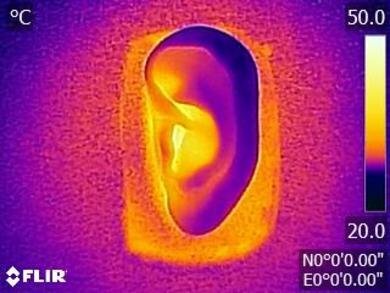 With the music at 100dB SPL, the leakage at 1 foot away will average around 25dB SPL, but peaks at 47dB SPL, which is just under the noise floor of most offices. The integrated microphone of the Samsung Galaxy Buds is mediocre. 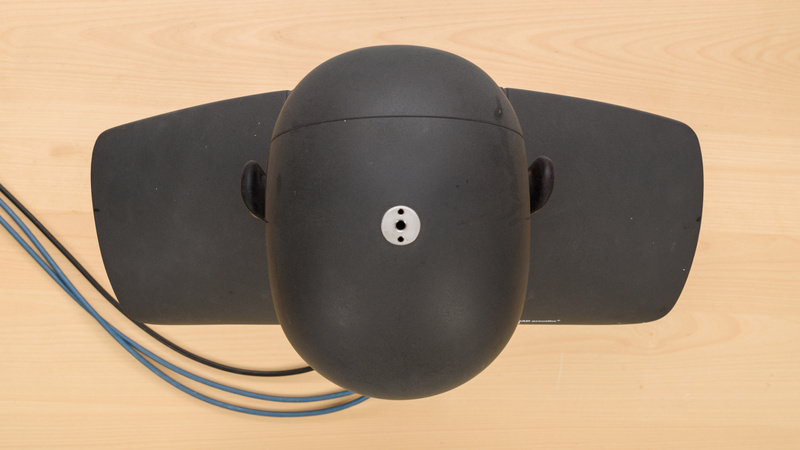 In quiet environments, speech recorded or transmitted with this mic will be relatively thin sounding, noticeably muffled, and lacking in detail. However, it will still be decently understandable. In noisy situations, it will struggle to separate speech from background noise even in moderately loud environments, like a busy street. The recording quality of the Galaxy Buds’ microphone is okay. LFE (low-frequency extension) is at 302Hz, which is sub-par. This results in a recorded/transmitted speech that's relatively thin-sounding. The HFE (high-frequency extension) of 3.4KHz means that speech will sound noticeably muffled and lacking in detail. This HFE performance is a limitation of the Bluetooth protocol and is a common shortcoming between almost all Bluetooth headphones. However, it will still be relatively easy to comprehend, since speech intelligibility is mostly dependent on the 500Hz-4KHz range. The microphone is mediocre at noise handling. 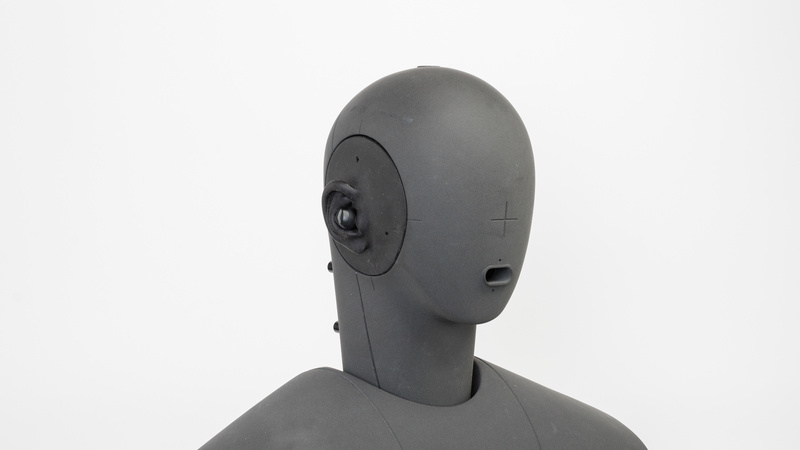 In our SpNR test, the mic achieved a speech-to-noise ratio of 11dB, indicating that it is best suited for quiet environments. 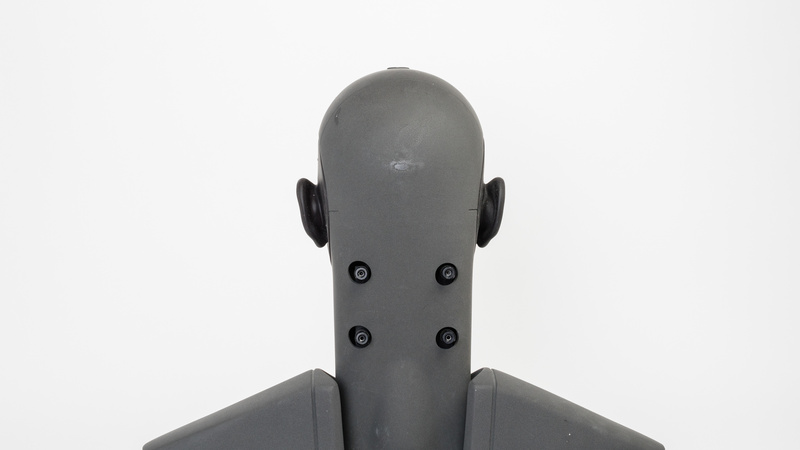 However, in moderate and loud environments, the mic will have difficulty fully separating speech from ambient noise. The Samsung Galaxy Buds have a great battery life of 7 hours, which is impressive for a single charge of truly wireless headphones. The case only holds one charge, for an estimated total of 14 hours, but that should be good enough for most users. 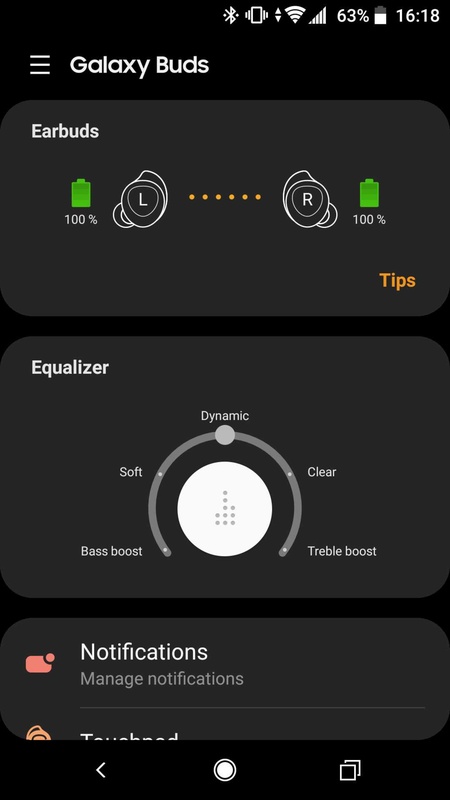 Also, the Galaxy Buds are compatible with the Samsung Wear app which offers decent control and EQ presets, but lacks a proper equalizer. The Galaxy Buds advertised 6 hours of continuous playback, but we measured more than 7 hours, which is great. This is one of the longest lasting battery lives on a single charge for truly wireless headphones we've tested so far. Unfortunately, their case only holds about 1 additional charge, which is noticeably less than most similar headphones, but at 14 total hours, it should long enough for most users. On the upside, they last about 20 hours in their standby mode according to Samsung’s specs sheet, and you can also use one bud while the other one is charging in the case, which is convenient. The Galaxy Buds are compatible with the Samsung Wearable app which offers a few information details and equalizer presets. You can map the touch-sensitive buttons of the earbuds inside the app to volume controls, voice commands, or ambient noise mode. You also have access to the battery data and you can enable a read-notification function. You can also make your earbuds beep loudly if you’ve lost them and are looking for them. The Galaxy Buds Manager is also available on Mac OS and Windows, but we would always get an error message when trying to run the app. The Galaxy Buds are straightforward Bluetooth-only truly wireless earbuds. They can’t be used wired, as expected, but their wireless range is pretty good. Unfortunately, we had connection stability issues with our unit, which could be a deal breaker for some. A recent update does somewhat help the connection stability issues, but we still had a few occasional audio cuts. Also, the latency of these headphones is very high and won’t be suitable for watching videos or gaming. These are Bluetooth-only headphones and support version 5.0. However, they can only be connected to one device at a time and don’t support NFC. Also, the connection stability of our unit was finicky, and we would get some drops in audio, even after installing the latest firmware update (which stated this issue was fixed in the patch notes). These truly wireless headphones can’t be used with a wired connection, as expected. The Galaxy Buds’ hard charging case offers an extra 6 to 7 hours of playback time, according to the specs sheet, but it doesn’t have any audio outputs, like most truly wireless cases. On the upside, it also supports wireless Qi charging. The wireless range of the Galaxy Buds is great. 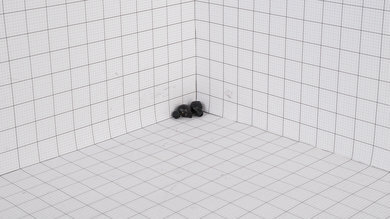 With over 50ft of obstructed range, you should be able to go to the next-door room without having too many audio cuts. 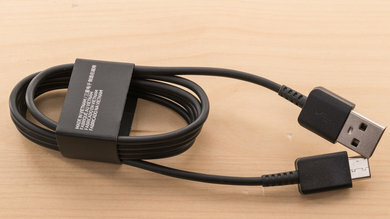 However, we had issues with our connection stability as the Buds would cut out at times. There was a firmware update to fix this, as stated in the patch notes, but we are still getting some audio cuts after installing it. Also, wireless range is dependent on your device’s signal strength and many other factors, so your results may vary. Their latency is very high, and you will notice a delay when watching video content or gaming. Some apps and devices seem to offer some sort of compensation, but the delay will most likely still be very noticeable. The Samsung Galaxy Buds are decent truly wireless headphones that set themselves apart thanks to their wireless Qi charging case and their versatility for everyday casual use. However, they have very high latency and we had a few connection stability issues with our unit. We suggest taking a look at our recommendations for the best truly wireless earbuds, the best wireless earbuds, and the best noise cancelling earbuds and in-ears. The Samsung Galaxy Buds and the Samsung Gear IconX are very similar headphones. They perform almost the same way and have practically the same audio reproduction. The Gear IconX have 4GB internal storage, which is very useful to load music on them and work out without your phone. On the other hand, the newer Galaxy Buds now support wireless Qi charging and have a noticeably better microphone. They also have a longer battery life, but latency is worse on the Galaxy Buds than the Gear IconX. If sound is the thing you care about the most, then the Bose SoundSport Free are a better option than the Samsung Galaxy Buds. Their frequency response is more neutral with a good amount of bass, which is great for their semi-open design. However, this also means they don’t isolate against ambient noise as well as the closed-back Galaxy Buds. You also get more battery life from a single charge from the Galaxy headphones, and get slight customization options. Decent for mixed usage. 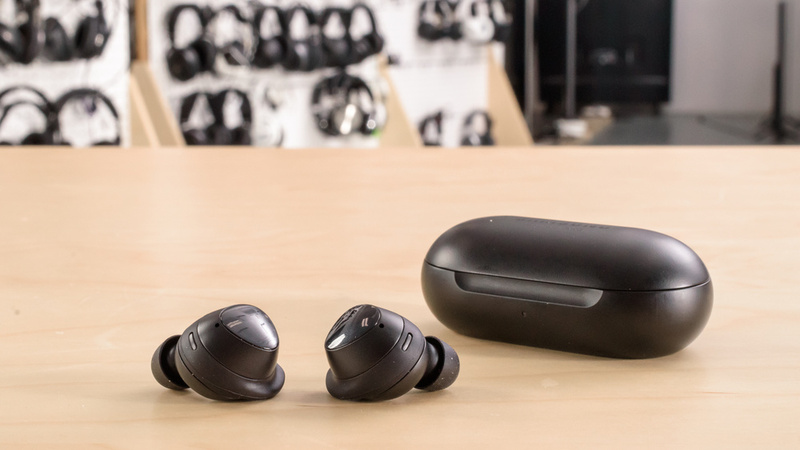 The Galaxy Buds have a versatile sound profile for different types of music, and their design isolates a decent amount of ambient noise, which is good for commuting and to use at the office. The buds are small and stable in the ears and are a great option for sports. However, their very high latency makes them a poor choice for watching TV or gaming. Decent for critical listening. The Samsung Galaxy Buds have a punchy and consistent bass, a well-balanced mid-range, and a great and flat treble. However, their bass is on the light side, and the mid-range is a bit overemphasized, meaning vocals and leads will sound a bit thick and cluttered. Their treble is also slightly sibilant and might sound sharp for some. Like most in-ears, they don’t have a great soundstage like other open-back over-ear headphones we’ve reviewed. On the upside, you do have EQ presets that help you slightly customize their sound profile. Good for commuting. While they don’t do a great job against low-frequency noises like engine rumbles, they are very comfortable and easy to carry around. Their battery life is also suitable for longer rides and flights, which is nice for truly wireless headphones. Great for sports. 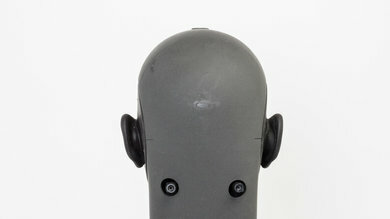 Their small bud design fits nicely into the ears and shouldn’t pop out during physical activities. They don’t trap heat inside the ears so you shouldn’t sweat more than usual when wearing them, which is great. However, they might have a similar clogging problem to the Samsung Gear IconX, which we will monitor as we continue to use them. However, they don't have internal storage like the previous model, which was useful for those wanting to work out without having your phone on you. Decent for the office. The Samsung Galaxy Buds do a good job at isolating against ambient chatter and high-frequency noises like A/C systems. They are also comfortable, but the in-ear fit might not be the most ideal for a long workday. On the upside, they barely leak, so you’ll be able to mask more ambient noise by raising your volume without disturbing surrounding colleagues. However, while their battery life is longer than most truly wireless headphones we’ve reviewed so far, it might still not be enough for a full workday and might need daily charging, especially if you plan on using them during your commute to work. Sub-par for TV. These in-ears are fairly comfortable, and their battery life will last you long enough for a long movie or a few episodes of a TV show, but unfortunately, they have very high latency and won’t be suitable for this use case. You will notice a delay between audio and video, which can get frustrating. Poor for gaming. Their latency is way too high for gaming and if you’re playing online games, their microphone is mediocre. They won’t be as customizable as gaming headphones we’ve reviewed so far, and we don’t consider the in-ear fit to be very comfortable for long gaming sessions.